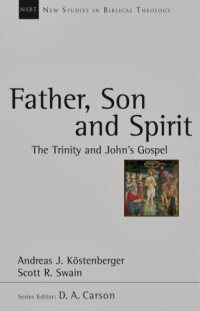 “Belief in the Trinity is not merely needed on the intellectual, cognitive level as part of subscribing to an orthodox Christian creed; it is that very triune God who is rightly the ground, energizing force, and goal undergirding the Christian mission” (164). 2) I’m finally realizing all that is at stake in debates about the definition of the word “person” in the phrase, “one being, three persons.” This is more than just an East-West issue, but something at play among those advocating a so-called “social trinitarianism” (which Kostenberger and Swain argue against in a footnote on pp. 174-5). I myself cannot say that I understand how you can have a “person” without a distinct consciousness and will. But I’d like to hear more what people like Augustine and Aquinas are trying to say here when they define “person” as a relation. 3) My greatest takeaway from the book was being convinced (especially from pp. 179-186) that it is valid to infer from the economic (historical) to the immanent (eternal). As they put it: “temporal missions reveal and are rooted in eternal processions” (180). The relationships of the Father, Son, and Spirit in their historical revelation do not have an arbitrary and random connection to their eternal relationships. This insight is not rooted in an out-dated translated of monogenes or biased interpretation of John 15:26 (though note the different tenses! ), but in the simple and necessary conviction that God’s revelation is true. Who He reveals Himself to be in history is who He actually is. After all, the entire purpose of the economic is to enfold us into the immanent (17:24-26), to bring us into the love and glory existing between the persons of the Godhead from eternity past – so why should it not reveal something of the nature of this love and glory? This insight is the fundamental reason why I affirm the filioque. If valid inferences can be made from the economic to the immanent, then it seems to me that Christ’s reception and bestowal of the Spirit in history (John 14:16, 26, 15:26, 16:7, Acts 2:33) reveals something of the eternal relationship between Christ and the Spirit. I’d like to study the Trinity more sometime. It would be fascinating, for example, to compare differing developments in the East and West, using Augustine and John of Damascus as test cases. Hey Gav! Good times last night. This is more than just an East-West issue, but something at play among those advocating a so-called “social trinitarianism” (which Kostenberger and Swain argue against in a footnote on pp. 174-5). How do K and S argue against social trinitarianism? I’m curious. This insight is the fundamental reason why I affirm the filioque. If valid inferences can be made from the economic to the immanent, then it seems to me that Christ’s reception and bestowal of the Spirit in history (John 14:16, 26, 15:26, 16:7, Acts 2:33) reveals something of the eternal relationship between Christ and the Spirit. Granting, for the moment, that the economic/immanent relationship is true, does this mean that the Holy Spirit causes the Son from eternity? For the economic relationship between the Spirit and the Son is one of causation (Luke 1:35, Matthew 1:18). Definitely dude. We gotta hang again soon.